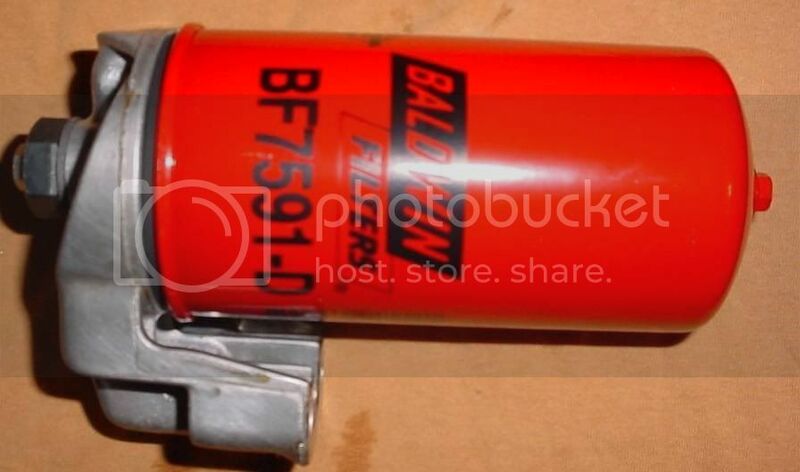 DeliveryValve had the idea and did the research on using the Baldwin fuel/water separator BF7591-D (with a drain) in place of the stock 10 Micron secondary fuel filter.The Baldwin BF7591-D according to the Baldwin rep is rated between 1 or 2 microns and it is a fuel/water separator in which includes a drain. It fits perfectly on the base with no grinding at all, but needs a M16x1.5 filter bolt. He also provided all of the material and funds for the project. My part of the project was to thread the filter housing and drill holes through the center and across the provided 16 mm bolt. The only real problem that came up was that the Bolt Head was too large for me to slip it behind the Lathe Chuck Jaws and would not allow the Lathe Chuck Jaws to close on the threaded shaft of the bolt. I had to swap ends and drill through the head of the bolt which meant that I had to drill the whole length of the bolt; which I had not intended to do. The reason for not wanting to drill the length of the bolt is that chips can build up inside and you can snap a drill off. This meant drilling a little and pulling the drill all the way out; clearing the chips repeating the same process over and over until the hole is safely drilled completely through the length of the bolt. Now I had an unintended hole in the head of the bolt to plug up. I decided to tap it for ¼”x28 threads and turn it into a bolt you could use to bleed the air out of the filter when you change filters; instead of having to loosen a banjo bolt. When I cross drilled the bolt I drilled through both sides of the bolt so if the holes look small in the Pics remember there is 2 holes instead of the 1 bigger hole that the stock central bolt has. The first Pic is one I copied from Delivery valve the rest I took. 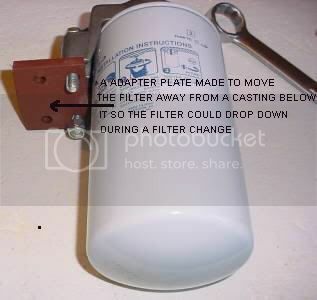 Depending on what is under the filter (may be different with different car/engine models) an adapter plate may need to be made to move the filter 1” or so away so that there is clearance under the filter for the filter to be changed. 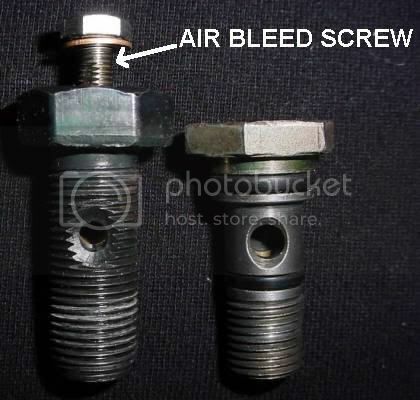 The modified bolt with the air bleed at the top is on the left. I will be installing this setup hopefully later this upcoming week. I really like the bleeder screw setup because I can use my Mityvac to draw the air out and fuel into the filter. It was a good problem for Diesel911 to have. Looks great. I'll definitely be doing this some day to get rid of my stand-alone water separator. 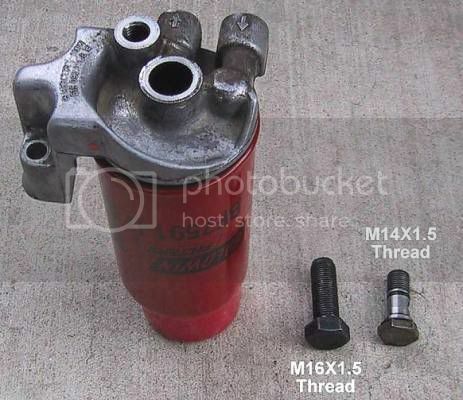 You should be able to get an M16x1.5 banjo bolt at most any hydraulic/hose shop. I would like to do this mod as well. You should sell a "conversion kit"
For some reason I thought that the bolt hole in the filter head was not threaded and the bolt just passed through into the filter. Nope, it passes through the housing and the filter screws onto it. Thats why we call it the bolt-on filter instead of screw-on. 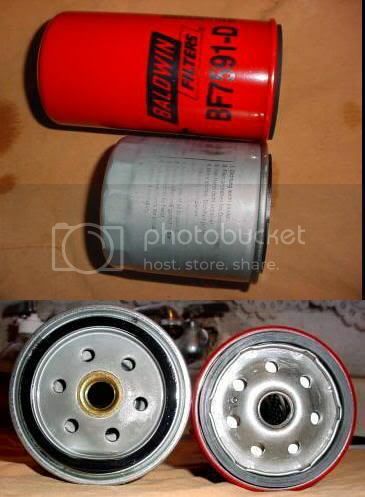 Why did the filter housing need to be tapped? Function as the o-ring? I tried. But my local hydraulic/hose shops around here don't have any. As Lance stated, it is not threaded. I had Diesel911 put M16X1.5 threads on the filter mount so that I can convert the filter to a screw-on type. 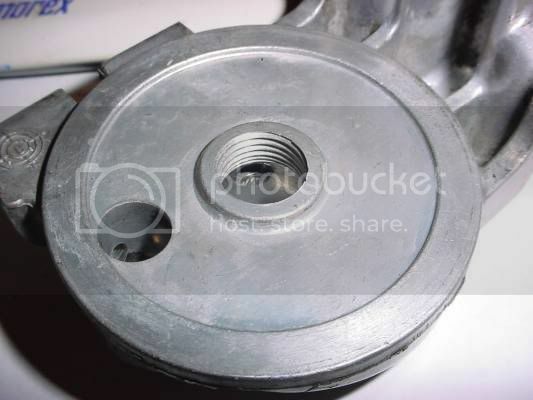 I also thought because the center hole of the filter mount tapers up to a larger size in diameter then the M16 bolt near the top of the mount, by having threads on the bottom would stabilize the banjo bolt for a better seal on the bolt head. I am planning on using gas rated Teflon tape on the threads to seal the banjo. In other notes, as stated the in links earlier Diesel911 is using a CAT 1R-0750 two micron filter mod on his car. He made a threaded adapter that is 1"-14 to use that filter. I think he stated that the true CAT filter is skinny enough that there is no grinding modification of the filter mount to install as opposed to the WIX 3528 version he originally used. But I'll let him talk about his version of this mod if he chooses for later in this thread. The original bolt/housing is not threaded part of this is because the origional bolt has an O-ring to seal it down in that area so the space around where the bolt sticks out is irrelvant as it is sealed further up by the O-ring. On our mod in order to use a similar O-ring set up would have required machining a whole new central filter bolt with properly sized grooves in it for the O-rings and the housing. To invent bolt from scratch would have taken way too much time. Using a regular bolt 16mm simplified things. We thought threading the housing was the simplest way to go. I am open to ideas; one of the reasons for this Thread is that we get ideas from other members. 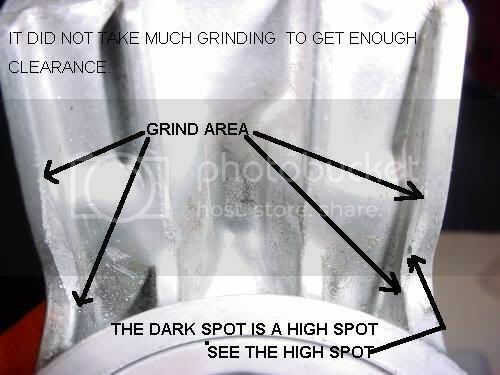 Maybe all we needed was a bigger hole with no threads but you will need to find something to seal that area or the fuel will not go into the filter in will bypass and go between the bolt and filter housing. What we did was DeliveryValves idea as he wanted to use that specific filter with a bottom drain. I chose a different path and had to make a threaded adapter for my choice of filter and a drilled plate to move the filter out further so the longer filter would have room to change. and I also had to lengthen the fuel line that returns from the fuel injection pump due to the banjo fitting having to be rotated in a different direction to clear the filter top. I used the NAPA version (3528) of a CAT filter. Since then I have recieved a real CAT filter 1R-0750 and the top of this filter has a smaller outside diameter than the NAPA one and I beieve it will require no metal removeal on the filter housing. Another bonus is CAT claims an absolut 2 micron filtration while the NAPA filter is only 2 Nominal Micron filtrations. Last edited by Diesel911; 06-16-2008 at 07:13 PM. Last edited by ForcedInduction; 06-18-2008 at 02:55 AM. The 10 nominal Micron Rating is the problem with the NAPA/Wix version. They do not offer any other version that has a lower micron rating. 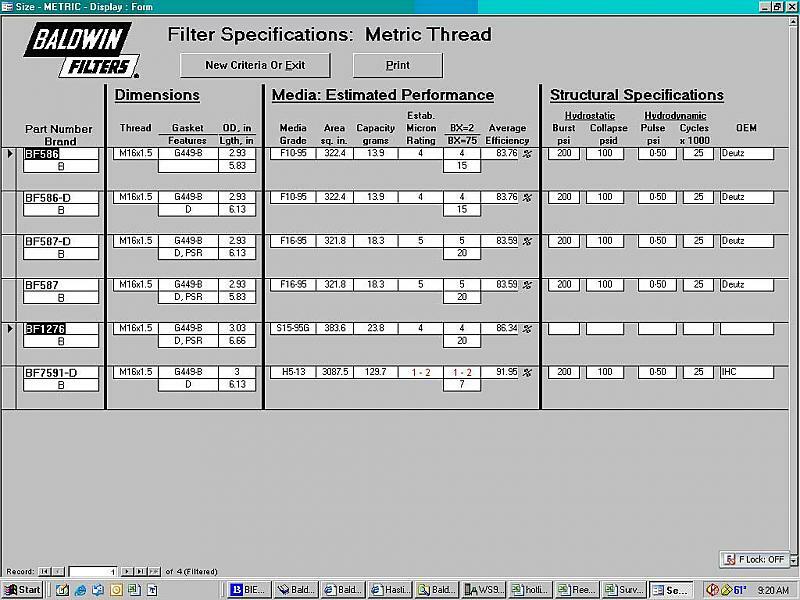 I have found as well as Diesel911 that other manufactures of the same type of filter have different micron ratings. Because of this, Diesel911 and I think that all filters should have a micron rating printed on the filter somewhere to avoid confusion. Here is the Baldwin screen print from the rep on compatable filters that use the same casings and gasket design. What was done about the wire harness and bracket below the filter? Why do this modification?... Isn't this over-kill? What size micron of particles will safely flow through the injectors? Is the factory recommended Mercedes filter not fine enough? It's a combination of finer filtration and the addition of a water trap. To me, both of these points equate to longevity of the injectors AND the PUMP (particles are abrasive).